Not to be confused with World 2-2, Level 2-2, or Stage 2-2. Area 2-2 is the second course of Jumpy Jungle and the eleventh course overall in Mario vs. Donkey Kong: Mini-Land Mayhem!. 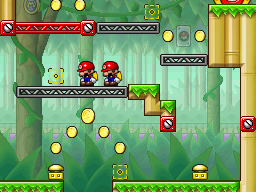 Both Mini Marios begin on a platform on the middle level, with the exit door on the top right. In order to reach it, they must simply be guided to a Long Spring in front of them to a Red Girder platform, then bounce on another Long Spring to the exit door. The M-Token is located on the top left, atop a Red Girder platform on the upper level. To collect it, the Mini Marios must simply use the Long Spring near their starting position. The Mini Mario Card is located on the right, just below the ledge where the exit door is located. The Mini Marios must be led to it in the same manner as the M-Token.